Fluoride toothpaste is pretty much the standard across the board these days. Fluoride has a lot of benefits to your health and is in a lot of things including tap water. However some people may not handle fluoride as well or just do not want to keep taking such high doses of it since it is in so much. So the question out there is then, is it okay to have a toothpaste that does not have fluoride in it? Dluoride toothpaste yes or no? Is it toxic, safe, good or bad for your health, skin? The simple answer to that question is yes that it would be. For centuries toothpastes and powders were used that had no fluoride in them and people seemed overall to be fine without it. Of course dentistry as a whole has some a long way so our teeth are healthier and it was not just fluoride toothpaste that got us there. There are several brands of toothpaste out there that go for the natural ingredients and are fluoride free, Brands such as Tom’s of Maine and Kiss my face. 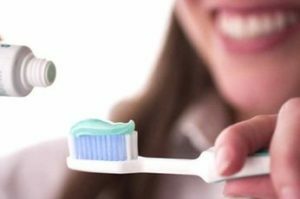 The choice whether or not to use toothpaste with or without fluoride just comes down to a personal one. There are pros and cons to both kinds of toothpaste but there are no real dangers in using either one at least not major ones unless you have sensitivity. You should always read the ingredients incase you have an allergy; organics (fluoride free) toothpastes will often use other items to help keep the teeth clean. If you have concerns about the toothpaste you are using whether it has fluoride or does not, speak with your dental professional about it. They will be more familiar with brands and be able to guide you in what you are using. If your teeth are healthy and you feel fine it may just be a case of if it isn’t broke don’t fix it.